Differences in philosophy for visual field (VF) testing have been noted. 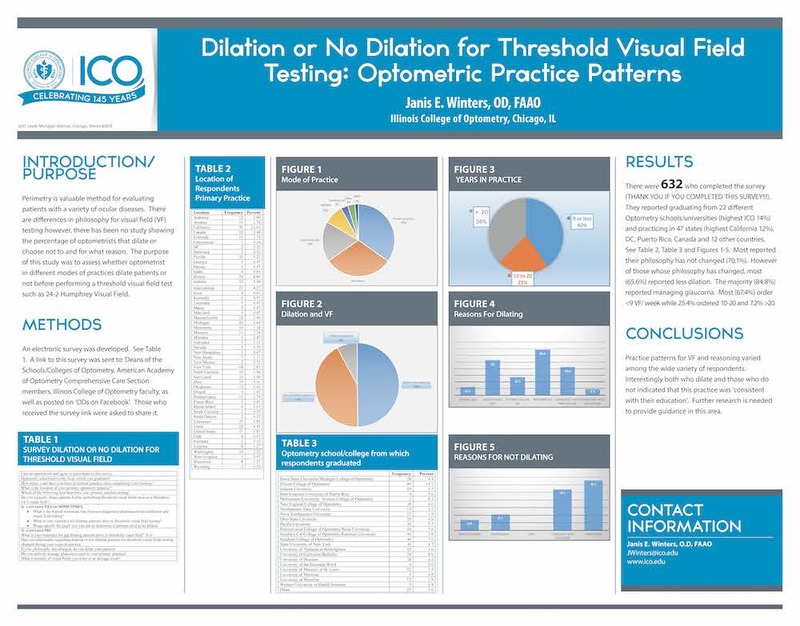 The purpose was to assess whether optometrists dilate their patients prior to threshold VF. 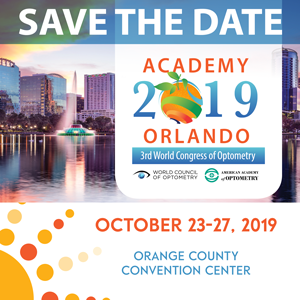 This study aims to evaluate the settling of a scleral lens and if this process is influenced by the nature of the fluid layer. 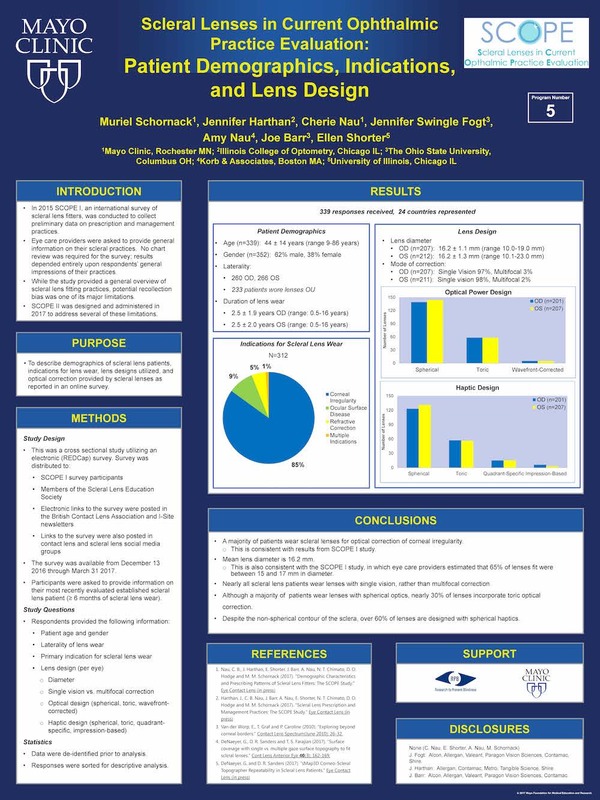 This multi-center study reports demographics of scleral lens wearers and scleral lens prescription patterns as reported in an online survey. 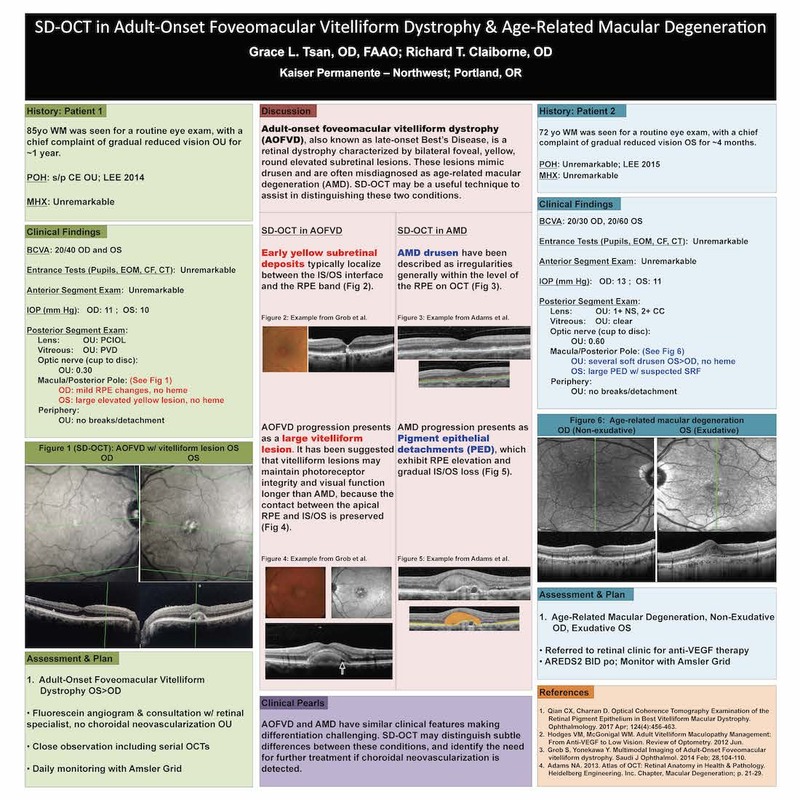 Adult-onset fovealmacular vitelliform dystrophy (AOFVD) is a retinal dystrophy, characterized by bilateral foveal, yellow, round elevated subretinal lesions. These lesions mimic drusen and are often misdiagnosed as age-related macular degeneration (AMD). 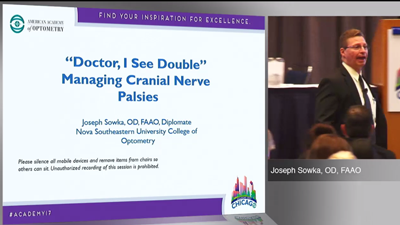 SD-OCT may be a useful technique to assist in distinguishing these two conditions. 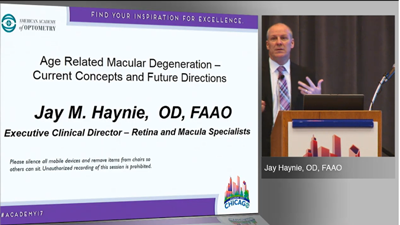 Many optical coherence tomography angiography (OCTA) devices are available, but not all of them provide quantitative measurements of retinal vasculature. Practitioners usually use publicly available image processing software to analyze OCTA images. 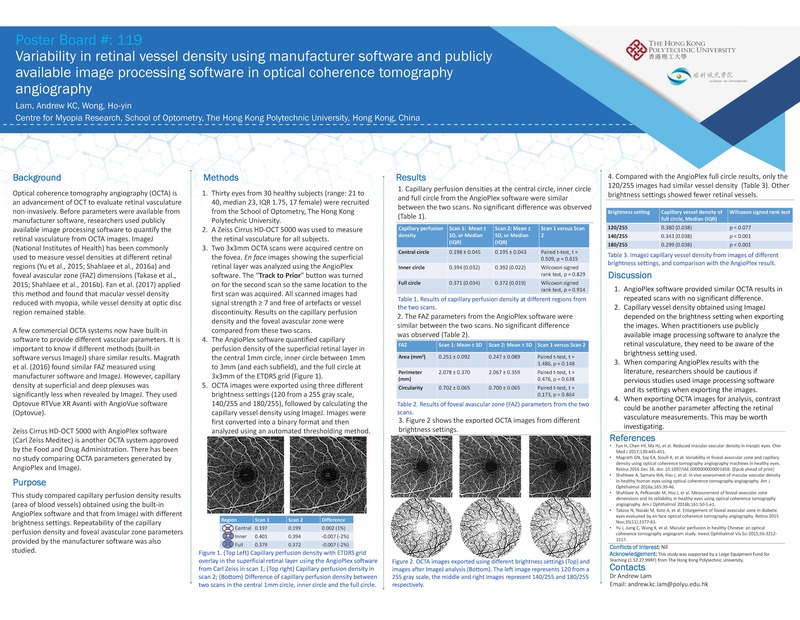 This study compared vessel density results obtained using ImageJ with those obtained using a software recently launched by a manufacturer. 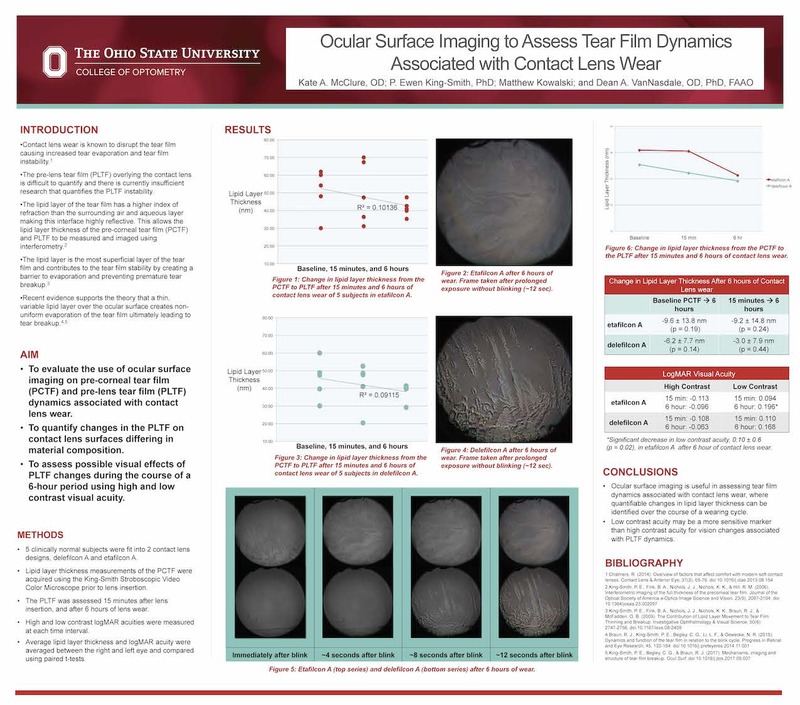 To evaluate the use of ocular surface imaging on pre-corneal tear film (PCTF) and pre-lens tear film (PLTF) dynamics associated with contact lens wear. To quantify changes in the PLTF on contact lens surfaces differing in material composition. To assess possible visual effects of PLTF changes during the course of a 6 hour period using high and low contrast visual acuity. 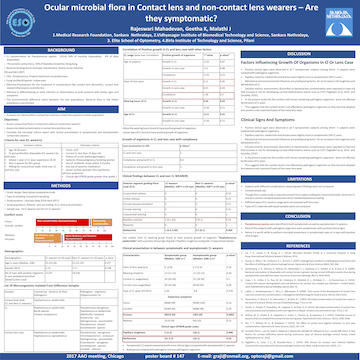 IPoster: Ocular Microbial Flora in Contact Lens and Non-Contact Lens Wearers – Are They Symptomatic? To evaluate the microbial profile in Contact Lens (CL) wearers and non- Contact Lens wearers and to compare with symptomatic and asymptomatic contact lens wearers. 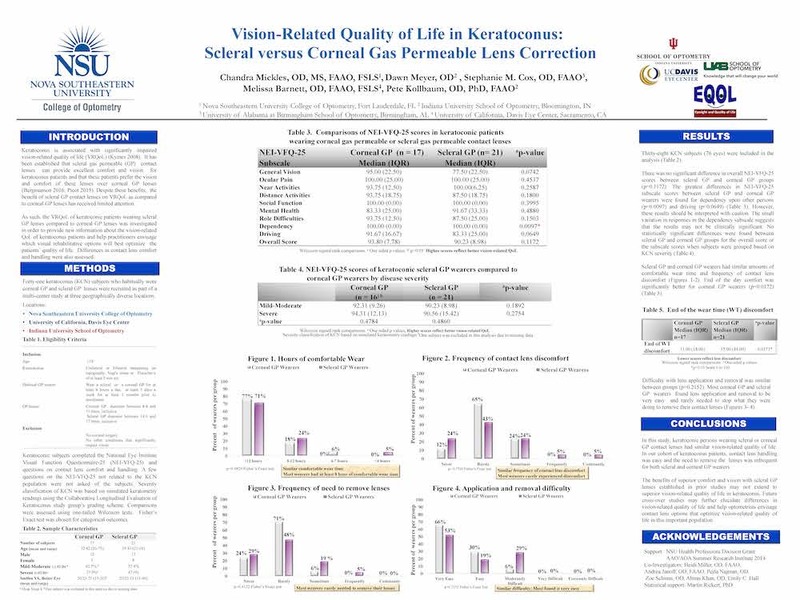 Toric haptic scleral lens designs are prescribed more often than in previous years. 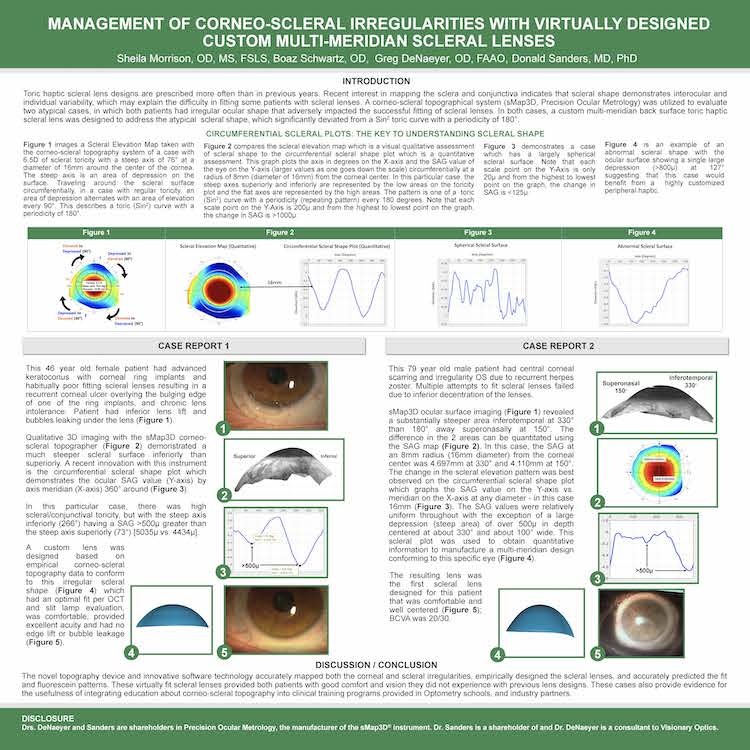 Recent interest in mapping the sclera and conjunctiva is proving that scleral shape is highly variable, and may explain the difficulty in fitting some patients with scleral lenses. 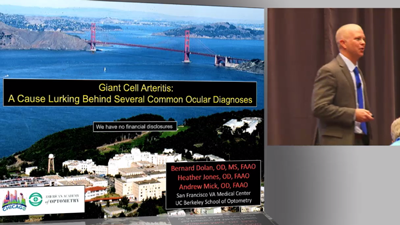 A corneo-scleral topographical system was utilized to evaluate ocular shape of two patients. 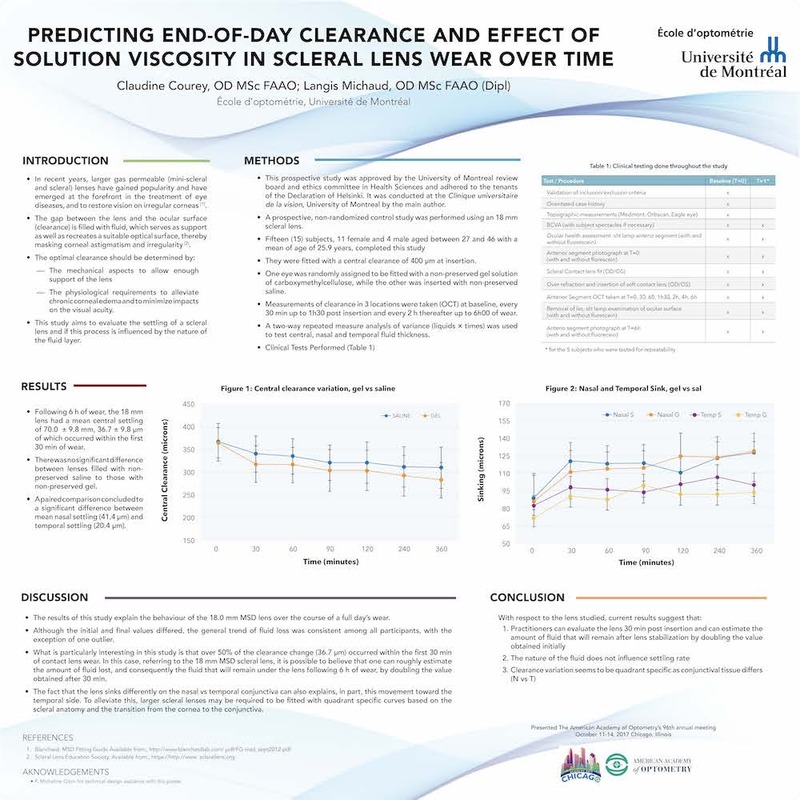 Custom multi-meridian back surface toric haptic scleral lenses were empirically designed to address the unusual scleral shape, which significantly deviated from a sin2 bitoric curve with a periodicity of 180°. Search the site by category, type or keyword.